MANILA – This month, Filipino consumers are being asked yet again to cope with increased electricity rates, spurring protests and renewed calls to scrap the Electric Power Industry Reform Act or EPIRA. The law is being blamed for having allowed electricity rates to increase so much. The Manila Electric Company (Meralco), the country’s biggest electricity distributor, recently announced it will hike its rates starting June. Citing a 54-centavo increase in generation charges, Meralco has proposed to recoup this via the generation rate adjustment mechanism (GRAM), which it could increase automatically under the Electric Power Industry Reform Act (EPIRA). 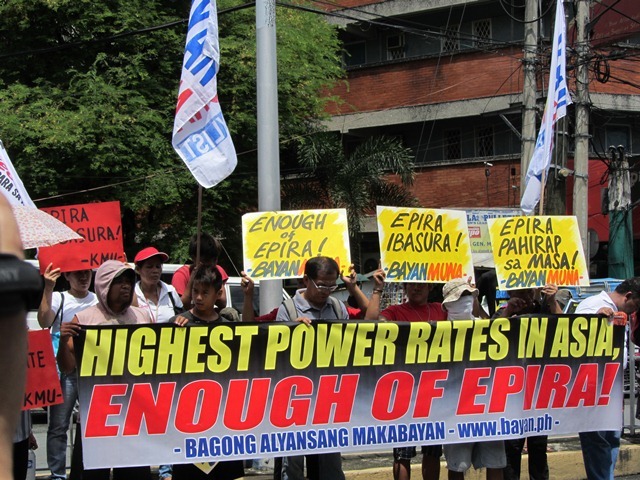 Given that electricity in the Philippines is already the highest in Asia, higher than high-income Japan, public opposition to EPIRA has been mounting. Business groups, large and small, have also complained of the rates, with some multinational companies relocating in other countries reportedly because of high electricity rates. “As things stand, power rates have made small and medium-scale businesses more inclined to close shop while bigger businesses transfer to other countries,” observed Elmer “Bong” Labog, chairman of Kilusang Mayo Uno (KMU). Progressive groups and consumers have questioned the continued implementation of EPIRA as its promised lower electricity rates “proved a sham from the beginning,” the KMU said in a statement. Last year, the multi-sectoral alliance Bayan (New Patriotic Alliance) submitted to Congress its review of EPIRA. The group has been urging lawmakers to conduct its own review of the said law, in hopes Congress could see the need to scrap it altogether. Noynoy appears to have a skewed sense of what democracy — and its strengthening is. During the Independence Day rites in Malolos, Bulacan, he again harped on the impeachment trial and conviction of ousted Chief Justice Renato Corona, saying that this has strengthened democracy. It should be asked: How on earth did the impeachment trial and conviction of Corona strengthen democracy, when in truth, it has weakened democracy, given the way the impeachment was worked on — and by Noynoy himself. Washington has granted waivers to sanctions on Iranian oil imports to several countries, leaving China the only major oil importer subject to US penalties. Chinese oil giant Sinopec announced it will not raise imports in an effort to allay sanctions. The US government added India, South Korea and four more nations to the list of countries exempt from the sanctions on Monday. Russian Foreign Minister, Sergei Lavrov, denounced that Iran did not participate in the international conference on Syria, as Tehran is an influential state in the region and in Syria. "Iran is one of the countries that have influence on the Syrian government," the Russian diplomat stressed Saturday in a press conference on Syria he called as soon as possible to implement the peace plan of the Special Envoy of the United Nations Organization (UN) to Syria, Kofi Annan. Shocking details have emerged from an impeccable source (not named for obvious reasons) of the execution on Thursday the 7th of June, in Baghdad, of Abed Hamid Hamoud, President Saddam Hussein's former personal secretary and aide. Mr Hamoud, fourth on America's 2003 asinine, juvenile playing card list of Iraq's sovereign government, has been held in jail since June 2003, after being arrested by US occupying forces. Arson at Isla Puting Bato? This was the story told by Isabel Solayao, 37, a resident of Isla Puting Bato, to Bulatlat.com two weeks after a fire razed their homes. More than 1500 families were affected by the blaze which began at around 4 p.m. until 6:00 in the evening. The fire started at a house near the entrance to Isla Puting Bato. There was only one way for the residents to flee: to the end of the Isla. Some residents scaled the wall while others jumped into the sea for safety. The cause of the fire remains unclear. There are rumors that it was caused by a gas tank exploding or illegal electrical connections or a child playing with matches. But some residents believe otherwise – contending that the fire was not accidental and that the perpetrators might have been paid. MANILA – Unlike Jonas Burgos, an activist abducted on April 28, 2007, military officials implicated in his enforced disappearance are being given an opportunity to defend themselves. “The chance that they are giving Harry to defend himself is not an opportunity they gave my son. But we are not like them. We are God-fearing. We know how to love and we know how to forgive,” Mrs. Edita Burgos, mother of Jonas, said. Jonas, who is also the son of late press freedom icon Jose Burgos Jr., was abducted on April 28, 2007 inside a mall in Quezon City. His family, friends and comrades continue to search for him to this day. 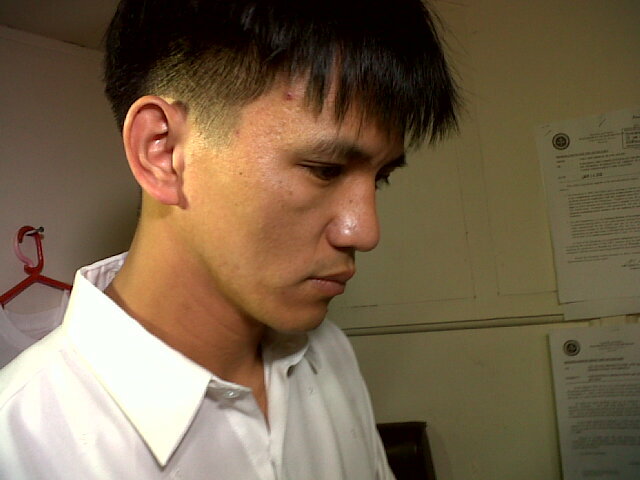 The military has long been implicated to his enforced disappearance but it was only until Jeffrey Cabintoy, the busboy of the restaurant where Jonas was seen eating, identified Major Harry Baliaga Jr. during the investigation of the Commission on Human Rights that his alleged abductors finally had a name and a face. Cabintoy, during the recent Writ of Amparo hearing before the Court of Appeals, positively identified Baliaga, who was sitting inside the courtroom. “It is him. It is him,” he said in Filipino. A year after they filed criminal cases of kidnapping and arbitrary detention against Baliaga, Lt. Col. Melquiades and Col. Eduardo Año and Obstruction of Apprehension and Prosecution of Criminal Offenders against former high ranking military officials namely former military chief of staff Gen. Hermogenes Esperon, Lt. Gen. Romeo Tolentino, Lt. Gen. Alexander Yano and former Police director general Avelino Razon, the Department of Justice finally summoned both the complainants and respondents for the first preliminary hearing. “I want to believe that there is hope. Today is the first hearing and I am happy that these people [referring to former top state security officials] went out to give their sworn statements [before the state prosecutor],” Mrs. Burgos told Bulatlat.com. A day after President Aquino made known to all and sundry that he wants the Precint Count Optical Scan (PCOS) machines to lord it over the 2013 polls, acting Chief Justice Antonio Carpio immediately scheduled the petitions against the use of the PCOS machines under an P1.8-billion budget for today. President Aquino, whose survey ratings are on a dangerous slide, initiated yesterday a shuffling of members of his Cabinet with the daughter of Budget Secretary Butch Abad bowing out of government service to pave the way for Energy Secretary Jose Almendras as the new chief of the Presidential Management Staff (PMS). Despite presidential spokesman Edwin Lacierda’s denial, and the usual alibis of having short or no information on media queries, Almendras is set to take over the PMS in a matter of two weeks as President Aquino has reportedly picked his preference for his replacement at the Department of Energy (DoE). With the Liberal Party (LP) ready to embrace Sen. Aquilino “Koko” Pimentel as its senatorial bet for 2013, the senator yesterday gave broad hints on his impending departure from the United Nationalist Alliance (UNA) as one of its senatorial bets in the coming 2013 mid-term polls following the formal pronouncements Monday of the coalition in drafting as a candidate in the race for the upper chamber seats of former Sen. Juan Miguel “Migz” Zubiri. Pimentel also broadly hinted that his party, the Partido Demokratiko Pilipino, will likely split the coalition consisting of PDP and Vice President Jojo Binay’s party, Laban ng Bayan (Laban). The most dominant Socialist-Democrats known to be closest to the President seemed to be packing things up in an apparent attempt to veer away from an administration seen as reluctant to implement an agrarian reform program that embodies their political ideology of promoting common ownership between the feudal lords and peasants. In a statement sent to reporters via e-mail, the Akbayan Party expressed “grave concern” over the poor performance of the Department of Agrarian Reform (DAR), especifically in the implementation of the Comprehensive Agrarian Reform Program with Extension and Reforms (CARPer), which was designed primarily to ensure swift completion of the distribution of agrarian-classified land to farmer-beneficiaries. The Department of Interior and Local Government (DILG) has ordered the full disclosure of jail expenses and donations, Secretary Jesse Robredo announced yesterday. In 2010, the DILG adopted the Full Disclosure Policy obliging local government units (LGUs) to make public their financial documents such as budget and procurement bidding. 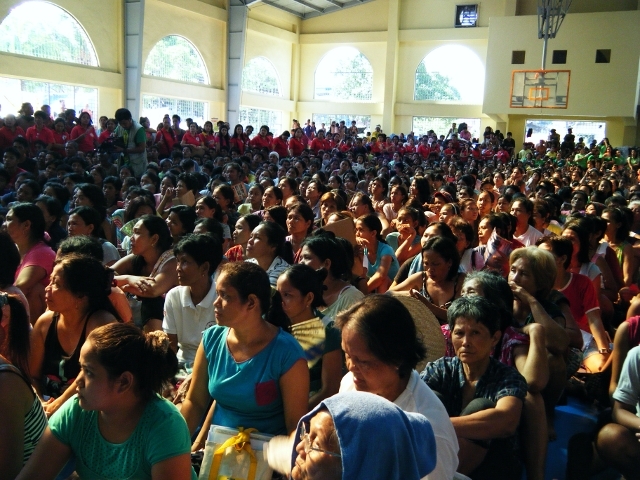 Since then, more than 90 percent of LGUs have complied with the policy. LAS VEGAS — Promoter Bob Arum said Monday he would ask the Nevada attorney general\'s office \"for a full and complete inquiry\" into the controversial Timothy Bradley-Manny Pacquiao title fight. Arum, who promotes both fighters, was among the many who voiced shock that Bradley was awarded the victory Saturday on two of three judges\' scorecards, giving him a split decision triumph that ended Pacquiao\'s 15-fight victory streak.